Trial is now under way in Case 002, which against three former senior leaders of the Khmer Rouge for atrocity crimes associated with the 1975-1979 reign of terror that left millions dead and shattered the social and economic structure of Cambodia. 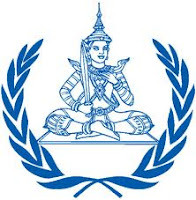 Opening arguments took place recently in Phnom Penh before the ECCC, the Extraordinary Chambers in the Courts of Cambodia (logo at left), about which IntLawGrrls have posted in the series available here. One of the innovations of this hybrid United Nations-national criminal court is the legal status of “civil parties,” afforded to victims who demonstrate that they suffered harm as a direct consequence of the crimes alleged against the Case 002 defendants. Pursuant to the ECCC's rules, if the defendants are convicted, these victims are eligible for collective and moral reparations. In this case the number of victims who have joined is almost 4,000. The court faces significant challenges to delivering justice to this unprecedented number of civil parties. On the eve of trial, the Court found one of the defendants, the 79-year-old former minister of social affairs, Ieng Thirith, mentally incompetent to stand trial. (prior IntLawGrrls post) The prosecutors have appealed the decision to dismiss her from the case, and in the meantime the trial continues against the remaining three defendants. At the same time, the investigations of additional perpetrators are stalled, which, as posted, prompted the resignation of the international co-investigating judge last month. With future trials in doubt, pressure is mounting for the ECCC to make the most of what may be its last trial. A joint report recently released by the International Human Rights Law Clinic at the University of California, Berkeley, School of Law, Access to Justice Asia and the Center for Justice & Accountability is aimed to help achieve that goal. Notably, the report recommends that the court establish a body of experts to determine the nature and scope of permissible reparations and to identify a mechanism that will be responsible for the collection, management, and disbursement of funds to implement effective reparations in a transparent and accountable manner. Such a mechanism would serve thousands of civil parties in Cambodia. It also would serve as an example to the International Criminal Court: Article 75 of the Rome Statute of the ICC likewise allows victims to request reparations, though no awards have yet been issued. The report notes that for many victims, the structure of the trial and proceedings before the Court may be a form of remedy in itself. These “procedural reparations” play an important role in how the victims experience the proceedings and impact their views on the legitimacy of the final judgment. The report outlines how the ECCC may ensure that civil parties play a vital role in the trial process. By so doing, the court may acknowledge the victims' suffering and help restore their dignity. Several human rights tribunals — most notably the Inter-American Court of Human Rights — provide procedural reparation by including in their judgments detailed accounts of the victims’ suffering and the measures appropriate to address the harm. The report calls on the ECCC to follow the example in Blake v. Guatemala (1999), a reparations matter in which the Inter-American Court acknowledged and honored the pain of victims by offering a careful treatment of the facts, as well as legal reasoning that supported the requests for redress. While the court recently altered its rules, the amendments still do not define what constitutes a sufficiently specific request for reparations. On this question as well, the report recommends that the ECCC look to the example of the Inter-American Court; specifically, to its judgment in “Mapiripàn Massacre” v. Colombia (2005), in which the court adopted a broader, less burdensome standard for assessing victims' requests for reparations. The ECCC is permitted only to award non-monetary relief to victims, in the form of “moral” and “collective” reparations. The nature and scope of what is meant by “moral” and “collective” remains unclear. In Case 001, the Court rejected reparations requests for access to medical care and education, noting that these requests were not enforceable because they involved monetary costs. Since the court’s revised rules contemplate allowing donors to finance reparations awards, the existence of monetary costs should not pose a legal barrier to similar requests from victims in Case 002, now under way. Although there will be no final ruling on reparations until the conclusion of the trial, the Victims' Right to Remedy report urges the ECCC to begin now to create a viable system to design and implement any future awards. Thirty-two years after the end of the Cambodian genocide, victims and their families have yet to receive justice. The Victims' Right to Remedy report offers analysis and recommendations that, if followed, will help the ECCC to live up to its potential to break new ground in international reparations law and practice. In doing so, the ECCC may provide a measure of closure for civil parties. The time to act is now.